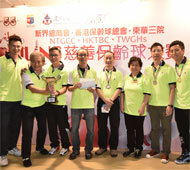 25th July, Hong Kong: New Territories General Chamber of Commerce Team A won the Team event of the Charity Bowling Tournament 2015 held in conjunction with the NTGCC 16th Asian School Tenpin Bowling Championships at SCAA Bowling Centre. NTGCC A Team members, Raymond Wong Wai Ming, posted 415, Chiang Kwok Fai 351, Chris Chui 375 and Wu Siu Hong 425 to bag the event with a total of 1566 pinfalls in a field of 44 teams. The Hong Kong Commercial & Industry D Team finished first runner-up with 1476 pinfalls. Second runner-up position went to Rocket Bowling Club D Team with a total of 1428 while Hong Kong Commercial & Industry B Team settled for third runner-up position with 1418 pinfalls. Hong Kong National bowler and NTGCC A Team member, Wu Siu Hong emerging as champion of the Men's Division with 425 pinfalls followed by TV artist Tam Chuen Hing of Hong Kong Celebrity Team in second with 420 and another TV artist Ip Wai in third with 413. Stanley Mak of Hong Kong Telecom A Team picked up the third runner-up position with 408. Without a doubt, Ms Rita Seeto of Rocket Bowling Club D Team was the star of the charity event when she bagged the Women's Division title with 484. She also won the high-game award with 286 and the high-series award with her two-game score of 484. Hong Kong national team member, Milki Ng of Hong Kong Commercial & Industry D Team finished as first runner-up with 360 pinfalls while Eileen Chan of Hong Kong Telecom C Team and Ma Yuen Ting, Hong Kong Celebrity Team settled for second and third runners-up with 347 and 341 respectively. Community Team captured the special Charity Cup event with a total of 1510 pinfalls. Arts Alumni Association Team finished as first runner-up with 1396 pinfalls. Last Chance Team took second runner-up spot with 1370 while the third runner-up position went to Queen Mary's Hospital Team with 1221. Fourty-four teams comprising of 176 participants took part in the Team event and five teams comprising of 20 participants took part in the special Charity Cup event. There were 148 in the Men's division and 48 in the Women's division. Dr Haywood Cheung, President of the New Territories General Chamber of Commerce, Ms Vivien Lau, BBS, JP, Chairman of Hong Kong Tenpin Bowling Congress, Hon. Life President of Asian Bowling Federation and Secretary General of World Bowling, Ms Mandy Tang, Director of Tung Wah Group of Hospitals were on hand to present prizes to the winners. The Charity Bowling Tournament co-organised by NTGCC, HKTBC and Tung Wah Group of Hospitals (TWGHs) to raise fund for TWGHs "Support Scheme for Elite Sport and Art Students". The Official Opening Ceremony of the NTGCC 16th Asian School Tenpin Bowling Championships will be officiated by Mr Timothy Fok, GBC, JP, IOC Member and President of the Sports Federation and Olympic Committee of Hong Kong, China and Ms Florence Hui, SBS, JP, Under Secretary for the Home Affairs of Home Affairs Bureau on July 26 at 12.30pm. For enquiry or more information, please contact NTGCC 16th Asian School Tenpin Bowling Championships Secretariat Office at +852 2891 9786. • Form D - Media Accred.